I don't usually watch movies during the first day of showing as I normally wait for feedback from social media sites and forums; not commissioned reviews but regular viewer comments. Hunger Games Mockingjay Part 2 is the only exemption. I watched it earlier during it's initial release date. It is the only one in the four movies of this series that I watched on the big screen. Although I'm heavily using the web and watch TV, I don't normally join the hype for what's in or what's hot whether it be movies, TV shows, or even books unless something about it catches my attention or I need a good film for a movie date (either with my husband or my daughter). I saw all three previous Hunger Games movies only on TV. There's a tradition in cable movie channels when a preceding film is shown before or during the release of a sequel. That's what happened with Hunger Games (the first ever film of this franchise) when Catching Fire (the sequel) was released on theaters. The former was all over movie channels when the second was showing. The same applied to the third movie Mockingjay Part 1. Despite not being an active follower, I do love Katniss Everdeen - her character, personality, and everything about her; flaws and all. It's her weakness which makes her strong after all. In Hunger Games, her good heart was seen throughout the games when everyone participating is supposed to be psychologically expected to act based on fear and adrenaline and just kill other district's tributes. On the contrary, she made friends and helped some enemies. In Catching Fire, it was no longer about survival but devising a way to end a dictatorship. But in Mockingjay Part 1, I agree with most critical comments that the entire movie's script can be summarized easily and seemed to have been merely stretched to milk more for two movies. Anyway, this 2-part finale movie is increasingly becoming a trend these days so I don't think it's a problem. The last movie made up for whatever Part 1 lacked - action sequences, surprised twists, and the Gale vs. Peeta love triangle with Katniss. There were several times when I was literally startled by something like bomb or gun blasts, Capitol mutt appearances, and more. I don't know why I got surprised but for me personally, this means that the movie effectively executed certain scenes in a way that I didn't see them coming. But what I did see coming even before I read materials about Mockingjay is Katniss' response to self-proclaimed interim president Coin's proposal to stage a special Hunger Games to execute Snow. I knew Katniss was up to something after she voted yes to the proposition; so when I saw Coin up the pedestal with her speech, I instantly thought Katniss will aim her bow at Coin. This is no surprise considering how Coin was obviously just after power from the beginning. For one, she didn't have second thoughts sacrificing troops. She also sent Peeta with the special team assigned to disable pods all over the Capitol's district. Pods are like booby-traps with various weapons embedded that are released when any mobility or activity is detected. Peeta was mentally conditioned to despise Katniss when he was captured at the end of Catching Fire. This explained why it was so easy for the rebels to rescue all victors during Mockingjay Part 1. The Capitol wanted Peeta out to kill Katniss. Boggs warned Katniss about Coin; that the Mockingjay's role to convince more supporters is over and they can proceed to liberate Panem without her. She was then viewed by Coin as a potential political rival due to her popularity. Boggs trusted Everdeen until his last breath. Still on Coin though, she also ordered bomb drops on refugees invited at the Capitol and blamed it on Snow. This strategy gained everyone's trust (even those who were loyal to Snow -peace keepers, guards, etc.) but killed innocent children, including Primrose who was at the area as a medical volunteer. Katniss knew that Coin will just become a spin-off version of Snow. So Coin died from a shot of arrow and Snow was hounded by families of previous Hunger Games tributes from various districts. Plutarch gathered all leaders and a real election was held with Commander Paylor from District 8 as president. Contrary to what some believed, Plutarch didn't become president but became Secretary of Communications as per the original Suzanne Collins book series. Sadly, the real life Plutarch (Philip Seymour Hoffman) died in 2014. Mockingjay Part 1 was dedicated to him when the credits rolled. Speaking of credits, as always, I waited for the movie's end but nothing follows after the film credits were rolled at the end. Lastly, among the surprise but no surprise story developments (for those of us who didn't read the books) is Katniss choosing Peeta over Gale. It's because he is kind and generous (using Katniss' own words). He was also able to recover from the psychologically devastating ordeal he went through at Snow's torture chambers (it was right inside his mansion) and remembered Katniss' love. Sharing the same dangerous situations during the Hunger Games must have developed and sealed their bond. There is some sort of theory behind this - when couples who go through hell and back again (figuratively) and eventually become lovers. Anyway, I believe that Catching Fire is the most romantic or romanticized sequel to this series; far more than Mockingjay Part 2. As for Gale on the other hand, he shared similar sentiments with Coin when it comes to war and rebellion; there will be lives sacrificed. Certainly, there were - including newly wedded Finnick. But all of them trusted Katniss and were aware of the dangers surrounding their mission. Going back to the love triangle, Gale seemed to have surrendered subtly to Peeta during a conversation when he noted how Katniss kissed Peeta differently each time. So yes, it was Peeta and Katniss at the end. When the latter was sent off away from the Panem's capital district after assassinating Coin in front of the crowd of residents, she found out that Peeta went home to their district as well. That scene when Katniss went to Peeta's room after waking up from a nightmare reminded me from a similar scene in Catching Fire. And fast forward to not-so-distant future, Peeta was playing outside their home with a little curly brown haired boy while Katniss comforts a baby in her arms after the infant seemed to have awoken from a bad dream. She shared her how she can overcome her own nightmares. The film ends there. 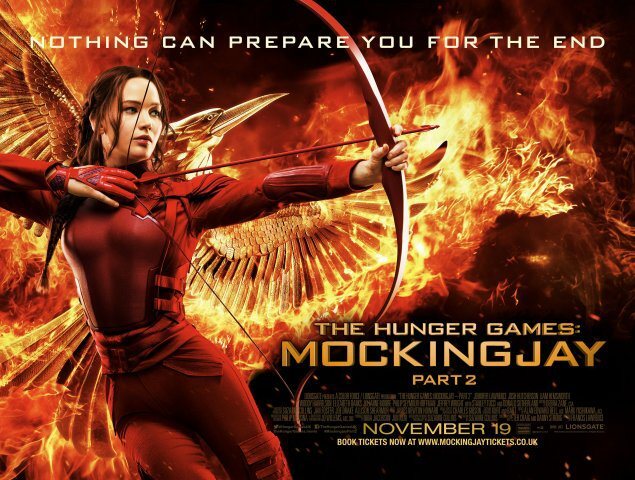 The entire Hunger Games series certainly has allusions to reality; politically and morally. Snow can be any dictatorial leader with a wicked taste for entertainment and ruthless means to stay in power. While standing up against leaders may seem like rebellion, it's actually part of our moral fiber; within the bounds of a concept called science of morality. But this deserves a more definitive explanation. Simply said though, it's in our human nature to naturally be against anything which can cause discomfort (physical or otherwise). Yet, there will always be people like Coin, who will take advantage of people's needs for their own advantage. So in lieu of that, I wanted to connect this movie with the upcoming national elections in the Philippines next year. I urge all to not elect people who wants to use power for their personal interests and will resort to dirty tactics to remain in position. 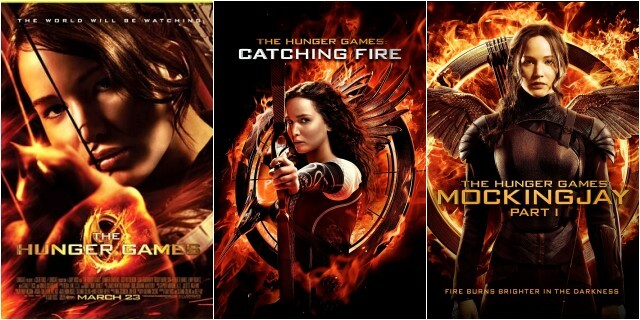 For the other trailers, interviews, TV spots, and the rest of the videos for this franchise, see the Hunger Games YouTube channel. For more infos including cast and characters, see this Wikipedia page.